Despite my many months of neglecting this site, people still show up every day. And sometimes they even ask questions. The most frequent question is whether I’ve made any changes to the adapted Bullet Journal approach that I described in posts like Making Bullet Journal My Own and My Search for a Two-Book Bullet Journal Setup. I’m always doing a little bit of tinkering with my daily journaling approach, but these days I’m more focused on simplification than on finding the perfect journaling workflow. I have a tendency of overthink things, and the search for the perfect paper-based system led me to a place where I was thinking more about the system, pen, and paper than about what I was actually trying to accomplish each week. My first simplification was to stop looking for the perfect notebook. It turns out that the perfect notebook was sitting in front of me all along. It’s called Field Notes. While there is something to be said for the superior paper options and on-page real estate that larger notebooks bring, Field Notes books offer two big advantages. First, they are easy to carry with me at all times. And second, if I use them daily, they fill up quickly. Filling up notebooks feels very satisfying. Now, I get to feel that satisfaction every week versus once a month with an A5 notebook. While I’m a longtime Field Notes fan, my descent into fountain pen madness significantly curtailed my Field Notes use. I know that plenty of people make fountain pens and Field Notes work by either not sweating the feathering and bleeding or by carefully selecting their inks and nibs. But even as I found some serviceable combinations of my own, I was never quite happy. Eventually, I came to a realization: as much as I like fountain pens, I like Field Notes more. I love the tactile quality of fountain pens. They feel great to use. 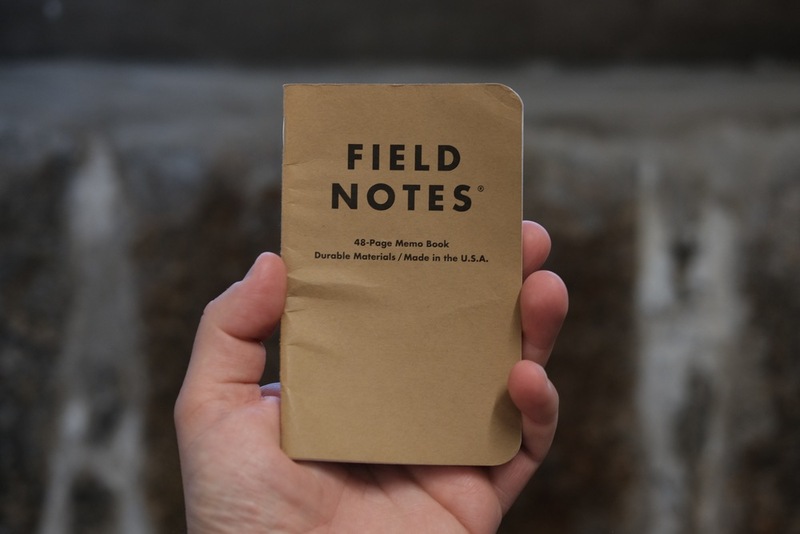 But Field Notes notebooks have both tactile and emotional appeal for me. It’s not just that Field Notes are a throwback product. Field Notes themselves now hold nostalgia for me. They’ve been around for nearly a decade in their own right, and my life is in a much different place now than it was when I first began using Field Notes. It’s better in most ways. But as I get older, it’s easier and easier for the practical demands of family life and my career to tamp down the “anything is possible” spirit I had a decade ago. As silly it seems, looking down at a familiar kraft Field Notes book brings that feeling back in a small way. I began my move back to Field Notes by adapting my two-book setup: one for lists/collections and one for day-to-day stuff. Eventually, I simplified further and went down to one book at a time. I’ve become a bit more pragmatic about augmenting my notebook use with electronic systems when it makes sense. For example, collecting books to read on an Amazon wish list is much more efficient than maintaining a written list in a notebook when you're not looking for an excuse to play with your fountain pen. Backlog: I set up the first two-page spread of every new Field Notes as a master list of things I need to get done. It’s not a list of life goals. It’s a mix of items – some very important and some very trivial – that I want to try to complete within the next one-to-two weeks. Waiting: The second two-page spread is where I log things that other people commit to do for me. I just kind of eyeball it periodically to make sure that the right follow-through happens. The subsequent pages in each Field Notes book are a mix of daily journal pages and notes. My journal pages start off as to do lists, drawing from the backlog and other ad hoc things that come up. At the end of the day, I often append a more traditional journal entry to get my thoughts out on paper. It’s not the perfect catch-all system, but it generally keeps me sane and on-track. Embracing simplicity in my system and the joyful familiarity of Field Notes kind of flies in the face of good pen blogging. At the same time, I’ve never felt more content with my approach. I definitely miss using my fountain pens daily and trying new notebooks, but I also value the comfort and familiarity that comes with using the same setup every day.